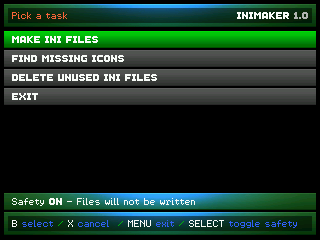 INImaker is a GP2X Wiz application that creates INI files for programs that don't have shortcuts in the Wiz Games menu. It can also find and delete INI files that link to deleted programs, and find missing icons. Please read readme.txt for instructions. now i dont have to make them myself. I'm glad to hear this program is getting used :) Any suggestions for future versions are welcome. Thanks Alex! That's really nice! Superb, thanks for saving me lots of time, every Wiz should have this! An option for switching between SD and NAND would be nice. kb_wiz: thanks for the idea, it's in update 1.1 now. Thanks Alex for implementing it so fast. Simple, Fast and Good :) But I would have wanted a function to manually erase ini files.